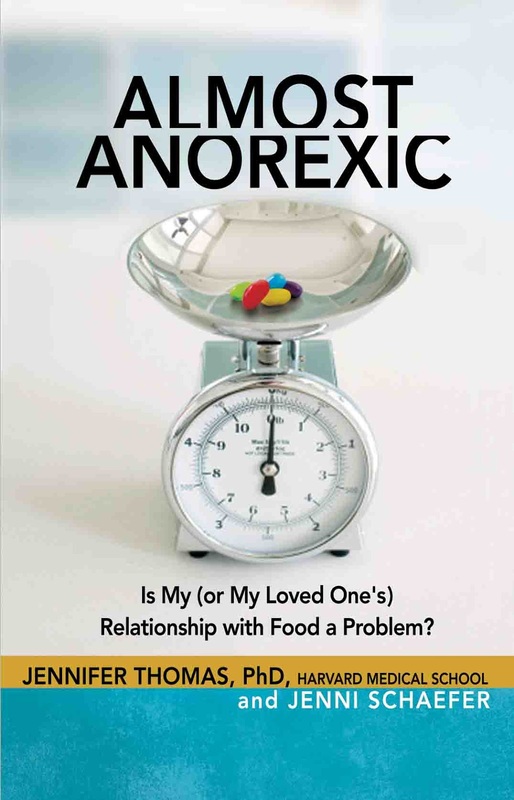 I finished reading Almost Anorexic: Is My (or My Loved One’s) Relationship with Food a Problem? last week or so. I am still really thrilled about it. The book gives very basic but very meaningful explanations of almost anorexia, which is what the DSM 5 now calls OSFED, but also (sometimes brief) explanations on the other eating disorder categories and some diagnostics behind them. The first couple chapters gives the reader enough understanding, in my mind, to be informed about almost anorexia. The book only increasing gets better from there throughout parts 1 and 2. Dr. Thomas uses stories from her personal patients to further explain examples of symptoms/behaviors of almost anorexia and how the example would be that and not something else. Along with Jenni Schaefer, the two use their unique voices and background to emphasize important points both from a scientific and from a personal level. All of it is easily understood and readable. It felt to me as though the two authors were speaking very genuinely and it definitely came across very meaningful. Though not all the stories/examples will deal with your particular eating disorder issues, there are a plethora of examples and there will likely be at least one or two you can relate to. For me, I found Kaitlyn’s and Meredith’s stories were the most meaningful to my personal eating disorder struggles. But that is just me and my story. When/if you read the book, or if you have, who do you relate to the most and why? I think it may just give you some insight into your own eating disorder because there is always more to learn when in recovery. It is especially in Part 2 of the book that Dr. Thomas and Jenni discuss more recovery-oriented topics such as body image/fat talk and intuitive eating. This part of the book, along with still containing stories and homework, focuses on how to move into recovery and through recovery. It also challenges those in recovery not to settle for less than full recovery, which the authors contend is fully possible. In Part 2 there was also a few humorous moments, which I found especially meaningful because they understood the sometimes humorous nature of the crazy beliefs that eating disorders have us believes. One of my favorite humorous lines of the book is in the Are You Just Trying to Make Me Fat? section on page 175 that reads: “Many individuals recovering from disordered eating believe that books, clinicians, and others are just trying to make them fat. …This isn’t Hansel and Gretel–where a wicked witch lures children into her candy-decorated house to fatten them up in preparation for eating them.” I had to laugh at that because I cannot count how many times I have believed that and said that to my treatment team. And how true is it! I would venture to guess that a significant portion of eating disorder individuals have felt this and putting it into a real-world and humorous context made the point even better than simply stating it. Another part in Part 2 I found meaningful for me was Stop Comparing (and Despairing!) on pages 218-220. It was helpful for me especially to read a couple of studies cited that comparing does lead to despairing and it is more than simply my personal experience. Other people are out there comparing themselves and I am not alone in that. Research helps to back up that it is not just me comparing myself and feeling worse for it, especially so feeling worse for because of a personal failing imagined or real. The last pages of significance for me that I am going to mention are pages 222-225, which discuss body image and clothes. This especially affects me deeply right now. I avoid buying new clothes for myself like the plague. I am stuck on the idea that my weight is going to re-distribute and settle still and that I should not buy new clothes. I still have some medical issues going on, which has an effect on my weight, and I keep weighting for things to work out. Those pages really challenged me, as quite a few people in my life do quite often, to rethink things and buy some new clothes. And maybe it is time..? Finally, the most significant takeaway from the book beyond the comparing, body image, and Hansel and Gretel, is my own personal reflection on my eating disorder. So much of the book is spent defining almost anorexia, choosing recovery, and not settling for less than fully recovered and it made me contemplate where I was at in my recovery. It made me realize that I am not so eating disordered anymore despite still generally defining myself that way. I still have a pretty big battle with body image, but the behaviors are not really there. It was a bit of a ah-ha moment for me. Overall, Almost Anorexic really is the whole package for anyone. I would recommend it to families/friends of those with eating disorders; those who simply want to know about eating disorders, specifically OSFED; those with almost anorexia; professionals; and anyone else who deals with individuals with OSFED on a day-to-day basis such as schools. I think what makes the book so powerful is that it has the research to back up the ideas, the personal connections to the ideas, the genuine voice(s) in the writing, and how it touches upon so many behaviors that everyone can find a story to relate to. Not only that, but it also includes so many helpful ideas for entering recovery and the basics of what it entails. It could really become a spark for someone out there who is struggling and does not know it or is in denial to finally go seek some help and give them the basics of what will recovery will mean and what exactly recovery looks like. I was really pleased with this book and I think others will be, too. I hope that you all consider checking it out. It is a really fast, easy read and for the “OSFED” individual (I will always say I have (had?) EDNOS–sorrynotsorry DSM5) it can be really meaningful. There is plenty to relate to and learn from. Note: You can find all the homework/exercises in the book here: http://www.jennischaefer.com/books/almost-anorexic/! I recently finished reading Almost Anorexic by Dr. Jennifer Thomas and Jenni Schaefer. In the last chapter it discusses having “a dream big enough to beat Ed”(pg 266) to fill the space in your identity that was falsely taken up by your eating disorder. It asks and dares you to ask yourself in this phase of your recovery, what are your dreams and are they big enough to overcome your Ed and to the point at which you are no longer in a space of “almost anorexic” but free from eating disorder behaviors, thoughts, actions, etc—in true recovery. Ever since I have entered this current phase in my recovery, I have discovered so many possibilities, dreams, and the love of life that I had lost. I dream now more than ever and I truly believe in these and believe that these dreams can happen. Before it was more like a fantasy that would never come true. Something may or may not have come along, but it would have never happened and even if it did, it meant nearly nothing. Now, there is so much to hope and dream for and actually achieve and feel. What if you made your own bucket list? What would you put on it? Getting married? Kids? Traveling? Go crazy! And dream BIG!